The cover has Furuhata Nao from SKE48. There is also a small photo of Uchida Maaya (内田真礼). There is a 6 page photo collection of Maaya at the back of the magazine. Maaya wears two outfits, a black outfit and a white outfit. Maaya will also appear in the next issue of Young Gangan No.09 as the cover girl, with another photo collection. Maaya's third single "Karappo Capsule" is on sale now. She is also doing the voice of Liliruka Arde in the TV anime Dungeon ni Deai wo Motomerunoha Machigatteiru darouka. 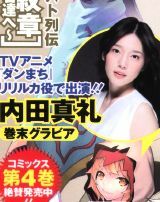 This magazine also comes with a serial code for the game Million Arthur.